Erick, you have used the lovely old-fashioned name for this constellation. In the 1930s, the International Astronomical Union gave this constellation the official name of Cassiopeia the Queen. 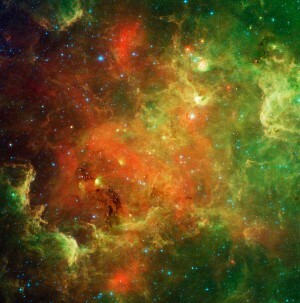 Nevertheless, skywatchers still see the chair, and speak of it. 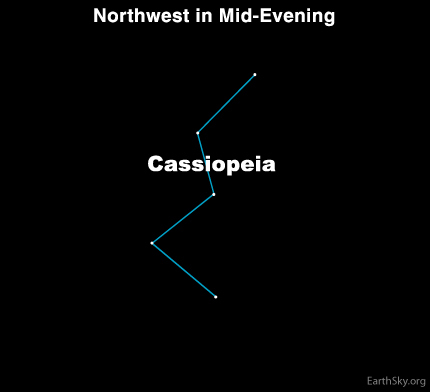 Cassiopeia was an Ethiopian queen in ancient Greek mythology. According to legend, she boasted she was more beautiful than the sea nymphs called the Nereids. Her boast angered Poseidon, god of the sea, who sent a sea monster (Cetus the Whale) to ravage the kingdom. To pacify the monster, Cassiopeia’s daughter, Princess Andromeda, was left tied to a rock by the sea. Cetus was about to devour her when Perseus the Hero happened by on Pegasus, the Flying Horse. Perseus rescued the princess, and all lived happily . . . and the gods were pleased, so all of these characters were elevated to the heavens as stars. Only Cassiopeia suffered an indignity. At nightfall, this constellation has more the shape of the letter M, and you might imagine the Queen reclining on her starry throne. However, at other times of year or night – like in the wee hours between midnight and dawn in February – Cassiopeia’s Chair dips below the celestial pole. Then this constellation appears to us on Earth more like the letter W. It’s then that the Lady of the Chair, as she is sometimes called, is said to hang on for dear life. If Cassiopeia the Queen lets go, she will drop from the sky into the ocean below, where the Nereids must still be waiting. A more modern February myth: Groundhog Day.